Most of the photos of telephones below were taken at the Pavek Museum of Broadcasting. Everything in quotes below came from the 1969 telephone poster at this site. The first telegraph line in Minnesota was opened on August 1, 1860, in St. Paul. Minneapolis was connected by telegraph on November 14, 1860. Working telegraph equipment is located in the St. Louis Park Historic Depot. The first trans-Atlantic cable was successfully laid in 1866, enabling American telegraphers to communicate with England, and vice-versa. The telephone was invented in 1876, demonstrated for the first time that June at the Philadelphia Centennial by Alexander Graham Bell. Telegrapher Richard Henry Hankinson installed the first telephone in Minneapolis in June 1877 between his home and Minneapolis City Hall. The first telephone circuit consisted of a single iron wire with a “wet” battery for power. 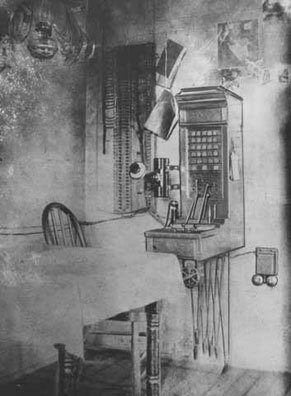 In 1878 Hankinson built the first switchboard in Minneapolis, which was made out of old sewing machine parts. On December 10, 1878, Hankinson organized the Northwestern Telephone Exchange Co. of Minneapolis. Public phones were thought to have begun in Bridgeport and Black Rock, Connecticut in 1878. In the early days of the phone booth, an attendant ceremoniously ushered customers in, bowed them out, and collected fees. The Northwestern Telephone Exchange Co. of Minneapolis started up operation with 53 subscribers (presumably businesses), in February 1879, and a line was strung to St. Paul in April 1879. In 1891 the Minneapolis Land and Investment Co. presented a replat of the center of St. Louis Park. One of the provisos was that the company retain the ability to erect telegraph and telephone poles. Citizens of Minneapolis Have Been Inspecting the New Plant and System of the Northwestern Telephone Exchange Company During the Week. A number of visitors have been entertained and instructed the present week at the new building of the Northwestern Telephone company. The plant has just been completed in every detail at a large cost, and in every respect it is strictly up to date. The visits were made in response to invitations by the company and by parties particularly interested in such construction. The building and the various parts of the plant with its paraphernalia have been described at length in The Tribune. The new switch board, to which the wires of all the subscribers are brought, and which bears the 3,000 little incandescent lamps that tell when the subscriber wishes to talk or is done, is the principal object of interest. An inspection of the plant is a real treat as an illustration of the application of modern science. In 1903 there were about 50 telephone subscribers in neighboring Hopkins. 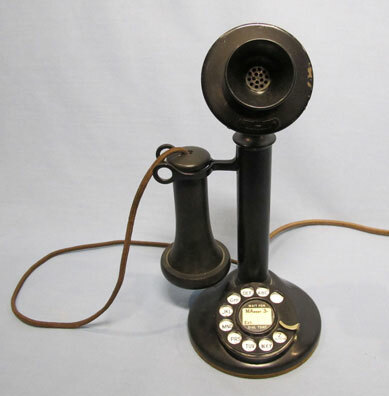 In 1905, only 8 percent of homes in the U.S. had telephones. 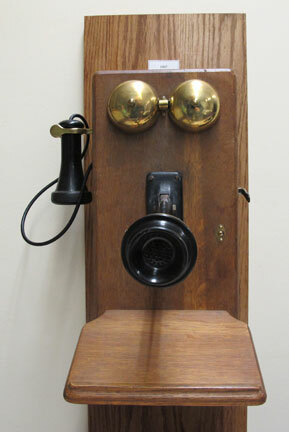 In 1908 telephone service was established between Minneapolis and St. Paul. The photo below is of an “Iron Distributing Pole, Twin-City Telephone Co., Minneapolis,” from the Cyclopedia of Telephony and Telegraphy, Volume IV, by the American Technical Society, 1911. The book admits that iron poles are rare, but predicted a shortage of trees for wood poles and a move toward concrete poles. In 1911 Northwestern Telephone Exchange Co. and rival Tri State Telephone Co. began putting in poles and installing phones (presumably in residences) in St. Louis Park. 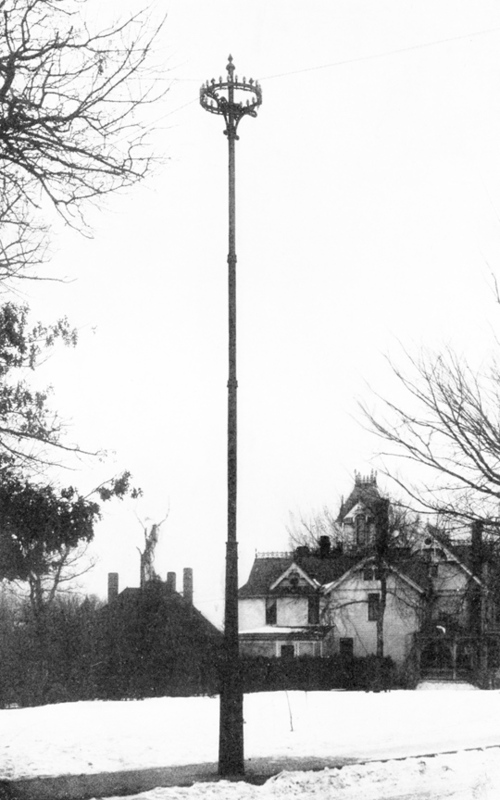 In the beginning, the companies apparently installed poles willy-nilly, with the Village Council occasionally forced to make them remove or move them. 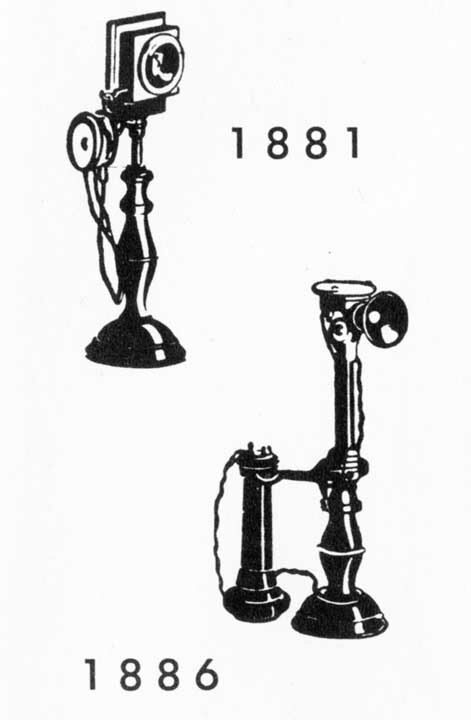 The two companies competed with each other head to head, with some households having two phones until the companies merged in 1920. A directory dated March 1920 provides listings for both Northwestern and Tri State, and a separate listing for Lake Minnetonka. It would take 35 years for a quarter of the nation’s population to have a telephone. Cell phones took a mere 13 years. “Small Boys Reap Harvest Handling Telephone Books,” reported the Minneapolis Tribune on December 3, 1911. One hundred thousand telephone directories are distributed and collected in Minneapolis three times a year… The work is intrusted (sic) to boys, who get from half a cent to five cents on each directory delivered and, on every old telephone directory collected, half a cent or one and five-eighths cents… The Northwestern Telephone Exchange company distributes the directories from the Main, Colfax, South, East and Central stations. The Tri-State Telephone and Telegraph company assembles all its books at its main station and rushes them to the different parts of the city. Special rates are given to the youthful “business men” who carry telephone books to Hopkins, St. Louis Park and sundry suburban homes. The books are made of special paper called “telephone” paper. It is a durable material that will stand much wear. The names and numbers are printed in special ink, and the whole book is bound with special machinery. In 1916 the Village Council voted to investigate the placing of a Tri State phone in the Fire Chief’s residence or the Monitor Engine Room. Marie Hartmann reported that Fire Chief Joe Williams had lines from both companies in his house, in addition to a third, direct line to Monitor Drill. The cut-over to the automatic system on the lines of the Tri-State Telephone company in Minneapolis was effected between midnight and 2 a.m. this morning. A couple of hundred expert electricians working silently but swiftly in the seven different Tri-State exchanges in the city accomplished the work. While one squad removed the tiny wooden pegs from thousands of telephone switches other squads severed the thousands of wires connecting with the old manual equipment and the entire Tri-State system became the automatic arrangement promised for months. Hereafter there will be no “Number please!” to greet you when you take down the receiver. Instead you will dial the party you wish to talk to yourself by pulling around the digits of the number wanted on the little dial attached to the base of your telephone. Regardless of which particular exchange your call goes through the mechanism is there and ready to do your bidding instantly. Minneapolis and St. Paul, including such suburbs as South St. Paul, Hopkins, and St. Louis Park are handled as one unit. There are no duplicate numbers. The article assured that all conversations were “secret,” that all former operators would be reassigned to other jobs, and that there were procedures in place to catch pranksters and those calling in false fire alarms just to see the horses run. All phone numbers would change, so everyone needed new directories. On May 5, 1918, the Minneapolis Tribune reported that the Railway Commission approved the unification of the Northwestern and Tri-State Telephone companies. The process would take two years, due to a labor shortage resulting from the war. In December 1918, the Commercial Club protested a proposed raise in telephone rates. “The first dial telephone exchange is credited to Almon B. Strowger who introduced it in LaPorte, Indiana, in 1892. It was many years, however, before switching equipment was sufficiently developed to permit dial installation in larger cities. New York City, for instance, began to get the dial in 1922.” The photo below is of a so-called “Candlestick” from about 1919. In April 1924 one of three fires in St. Louis Park in one day was so hot that it destroyed a telephone cable and phone communications were cut off in part of the Village. Prior to 1940 all exchanges were Walnut. In 1940, Whittier was added. In 1942 ads asked citizens to turn down the lights and not use the phone over the Christmas holidays. Northwestern Bell cited the lack of copper as the reason for inadequate phone lines for the growing demand. Northwestern Bell reported that there were 480,000 telephones in the State. 2.89 million calls were made per day, and the company had 6,100 employees. In 1947 the Village Council wrote to the State Railroad and Warehouse Commission to protest the increase in Northwestern Bell’s phone rates. Telephone workers went on strike in Minneapolis in 1947. A 1950 statistic indicates that three fourths of all phone service in the United States was by party line. Although 92 percent of establishments had phone service in 1952, the nation had many more phones than lines, creating problems for people with party lines. One solution that the State legislature briefly considered in 1953 was a seven-minute limit on calls. In March 1951 citizens requested that four temporary pay phone stations be placed west of Texas between 33rd and 36th. Providing phone service to this new neighborhood was slow because of the scarcity of lead-covered cable. In January 1952 there were 1,100 people waiting for phones. The 7-digit numbering went into effect, and all Walnut and Whittier exchanges south of the Great Northern Railroad, east of Texas, and west of Highway 100 became Mohawk 9. This change affected 550 customers. Dispatch article January 10, 1952. In March 1952 Flash Radio Sales and service sold the Village Kellogg Select-O-Phone Automatic Telephone equipment for Village Hall and the Fire Department building. In 1954 changes were made in the exchange names of phone numbers (see below). In 1954 Minnesota was split into three area codes, with 218 to the north of the Cities and 507 to the south. On October 17, 1954, at the behest of the Minnesota Railroad and Warehouse Commission, Northwestern Bell combined Minneapolis, St. Paul, and their suburbs into one telephone service area. The move removed all charges on about 99 percent of the calls between the Twin Cities. The phone company placed more than 50,000 miles of additional underground cable and spent $2.5 million (or so they said) on the project. The new system of making calls still sounded a little complicated, and the phone company published a booklet to walk customers through the process. The Pavek Museum of Broadcasting has the demonstration machine shown below, and it could be from this era. Northwestern Bell reported that there were 837,300 telephones in the State, making 4.65 million calls per day. The company had 9,100 employees. An ad in the Minneapolis Tribune dated January 1, 1956, reported that in 1955 the company put in 44,500 phones and converted nine locations to dial phones, giving Minnesota 88 percent dial service. The ad also showed us how someday we would wear a telephone on our wrist. They weren’t far off! January 1956 saw the Park’s first fax machine, called an “automatic telegram sending and receiving machine.” It was located at the office of Granberg Brokerage, Miracle Mile. The machine was owned by Western Union. Such machines had been used for several years in Minneapolis. One of its features was that a bell rang when a message came in. August 18, 1957, inaugurated Direct Distance Dialing – Parkites no longer had to go through an operator to make a long distance call. In September 1958 we no longer had to dial 8 for St. Paul calls. On July 10, 1962, Telstar, the world’s first international communications satellite, was rocketed into orbit with the collaboration between NASA and the Bell System. Telephone calls could now be “bounced” off a satellite to a switching station. Bell System introduced the touch tone phone in 1963. This telephone made a different beep for each number instead of counted clicks for each number. In 1964 the electronic telephone switching system was instituted, allowing calls to be switched faster than ever before. Early skype (called the Picturephone), introduced by the Bell System in 1964. In 1965 phone numbers in the local directory reflected a change from exchange names to all numbers. The first commercial communications satellite, Early Bird, was placed into service. The Wide Area Telephone Service, or WATS line was available for use on November 1, 1966. It had first been available only on an outgoing basis, but could now be set up so that the receiving company would pay for incoming calls. In 1967 Northwestern Bell reported that Minnesota had 14,750 public phones: 6,520 in the Minneapolis metro area and 3,160 in St. Paul. The biggest concentration was the 163 on the U of M’s Minneapolis campus. The Airport had the largest number under one roof: 132. In May 1968 there was a telephone strike. Motorola demonstrated the cellular telephone to the FCC in 1972. Prior to 1973 mobile phones were limited to those installed in cars and other vehicles. On April 3, 1973, Motorola produced the first handheld mobile phone. The prototype handheld phone offered a talk time of just 30 minutes and took 10 hours to recharge. In 1974 new Centrex phone systems were being installed at local businesses such as Honeywell, requiring some numbers to change. In 1979 an electronic switching system replaced an electro-mechanical system. This move allowed for custom calling for the first time: call forwarding, three-way dialing, speed dialing, call waiting, and touch tone. On December 1, 1982, the Twin Cities adopted the 911 emergency number, eliminating the need for those ubiquitous orange stickers on phones with the City’s police and fire department numbers. Earl Bakken’s mobile phone from 1985. It plugged into a car’s cigarette lighter. In 1996 area code 320 took over all 612 numbers outside the metropolitan area. In 1998 St. Paul and suburbs switched to the 651 area code. In 2000 area codes 952 and 763 were created.